OfficeServ Concierge Basic Business Phone Systems Albany NY | Samsung Phone Systems Albany | Allied Telcom | Allied Business Systems	| Allied Business Communications, Inc. Need an easy-to-operate, reliable phone system for your small hotel, motel, lodge or bed & breakfast? 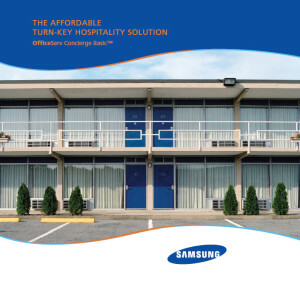 The Samsung OfficeServ Concierge Basic was designed with you in mind. Fully operational without the need for a costly Property Management System (PMS), the OfficeServ Concierge Basic is an efficient call management solution with guest billing for properties with up to 50 rooms. At its heart is the hardworking Samsung OfficeServ 7200 system. And with it, you’ll find everything you need to run your property easily and effectively.